Alpha Omega Senior College (AOSC) is a modern coeducational High School for year’s 7-12 students that was established in 2011. AOSC values academic excellence and provides a progressive education in a dynamic and caring educational environment. A comprehensive curriculum is taught by highly qualified specialist teachers to provide all students with an unrivalled opportunity to achieve their full educational potential. Our school motto is Belief – Action – Change. We believe these are the steps to a successful schooling life and a successful life beyond the classroom. Our aim is to produce quality students who are engaged citizens with the knowledge, skills and capacity to meet the challenges of a changing world. In a fast-paced world where children often feel overwhelmed , our student-focused PD program allows students to unwind and get in touch with what’s important to them. A weekly PD session provides students with the opportunity to develop their skill set, challenge their thoughts and stir their conscience. We’ve always been impressed by the remarkable academic and personal growth our students make in just two years at Alpha! Can you imagine the possibilities available if Alpha could teach your child from as early as year 7? It’s time to stop imagining, 7-12 is now here at Alpha! Please enter the following information and one of our staff will get in contact with you as soon as possible. What year are you interested in enrolling your son(s) or daughter(s) in? Would you like to book in a One on One Meeting with a member of our team? What is your preferred time/times for a one on one session? Which group information session would you like to come to? with what we have on offer. Alpha Omega Senior College (AOSC) is a modern coeducational college for Year 9 and 12 students from a diverse range of backgrounds. AOSC welcomes families of any cultural background and of many faiths. AOSC believes all students have a right to quality education and the diverse nature of the student body and the students’ individual talents, interests and skills enrich and benefit the entire school community. The policy will provide guidance to all staff involved in the school’s enrolment process to ensure that their practice leads to compliance with all relevant School policies and Government legislation. All School staff involved in the enrolment process, students and parents/guardians. This policy has been developed in order to provide guidelines for the enrolment of students to ensure that all enrolment applications are dealt with justly and consistently. Who will abide by the school’s regulations. While the policy is as comprehensive as possible, there will inevitably be some situations which are not specifically covered. In such instances, it is the Principal’s responsibility to decide the appropriate course to take in the circumstances. The Acts as referred to in “ASSOCIATED DOCUMENTS/REFERENCES/LINKS” make it unlawful to discriminate against a person by refusing to enrol them at the School on the grounds of their disability or race. The School is committed to fulfilling its obligations under the law in this Enrolment Policy. 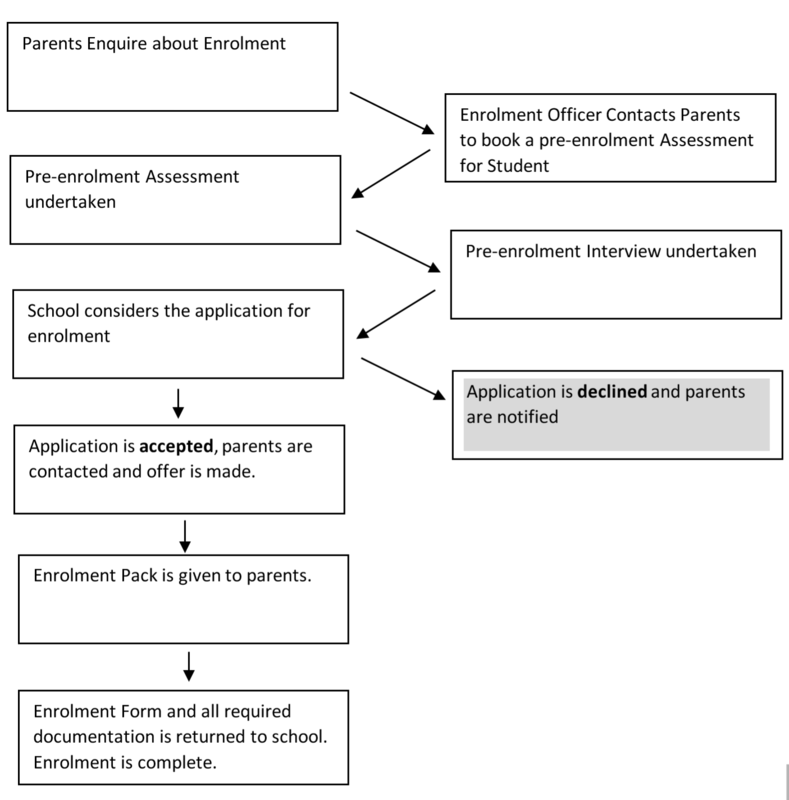 The following outlines the process for enrolling a student into AOSC. General Enrolment relates to any student who is eligible for a Record of School Achievement and has met AOSC Standard Testing for entry into the school. Where a parent or guardian wishes to appeal against the decision for non-enrolment the Principal will seek to resolve the matter by determining whether the stated criteria for enrolment have been applied fairly. The Principal reserves the right to offer or decline a position to any student and the Principal’s decision is final. When a student leaves prior to the completion of Year 12, one term’s notice in writing to the Principal is required before withdrawal of a student from the School. Notice of withdrawal for the following year must be received before the commencement of Term 4. One Term’s school fees will be payable in lieu of notice. Confidentiality and privacy require that all staff must ensure that information regarding students and their parents and/or legal guardians is restricted to those who genuinely need to know. Furthermore, those people should only be told as much as they need to know and no more. The school respects all right to Privacy and is bound by the Australian Privacy Principles (APPs) contained in the Commonwealth Privacy Act 1988. In relation to health records, the school is also bound by the New South Wales Health Privacy Principles contained in the Health Records and Information Privacy Act 2002 (Health Records Act). Information concerning all applications will be kept on file. Unsuccessful application information will be kept for five years. Successful application information will be kept for the duration of the student’s enrolment at the School plus seven years after leaving the school.